It is copyright © Stephanie Bolster and Jacket magazine 2007.
till her eyes stream and she melts with laughter. alone and adrift in her rowboat. in their limited edition collector’s plates. tarts filled with peanut butter. washes her hair, greases his own. their tear-blotched faces could be anyone’s. and let the speed and flare approach. of pull-out bed and pull-up blind. the shade and empty ponds appeared. and didn’t let it out, and haven’t. twisted in its limbs) a mystery. We might know it by another name. The poem’s apparently one of his finest. all day or take off your coat and stay awhile. better things but none as good as this. the space I claimed by seeing. from our balcon, no, oversaw. as it does now in the mind, my little street. When they first put a cow in a zoo in Ireland. When a giraffe gave birth easily in a suburb. Birds we do not know the names of. Kids point to her jaw, chewing, and ask. Yesterday they came, finches or warblers, their breasts purplish as new growth then gone. Yes, the Tereus outstreams fate. This might be the Nile or another mouth. We gather on the deck between above and under. Blue goes the owl and the ticking bats. Churning where the river meets the sea. The votive dragon, phoenix stitched of silk and not of fire on the water. And the dog star and the Isle of Dogs. And heaven upon the waters. Stephanie Bolster’s first book, White Stone: The Alice Poems, won the Governor General’s Award and the Gerald Lampert Award and appears in French with Les Éditions du Noroît translated by Daniel Canty. She has also published Two Bowls of Milk, which won the Archibald Lampman Award and was shortlisted for the Trillium Award, and Pavilion. 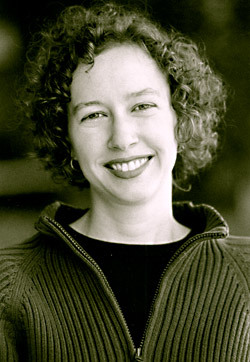 Bolster edited The Ishtar Gate: Last and Selected Poems by the late Ottawa poet Diana Brebner and is guest editor for the inaugural The Best Canadian Poetry in English 2007 anthology. She teaches creative writing at Concordia University in Montréal.